Your one and only mom deserves a really special birthday party at Great Clips to celebrate how incredibly old she has become. These tips will guarantee that she has the most magical time possible. 1. Make sure that none of her party guests have hair: Just as it’s a huge faux pas for a bridesmaid to wear white to a wedding, guests at a Great Clips birthday party should never upstage the woman of the hour by having hair of their own. Be sure to only invite people who don’t have hair if you want your mom to feel like the belle of the ball. 2. Get there right when it opens to make sure there aren’t too many other birthday parties happening at the same time: Great Clips is basically Chuck E. Cheese’s for the post-menopausal set, so if you go there during prime hours, you’ll have to compete with a whole bunch of other moms having birthday parties. On your mom’s special day, beat the rush by arriving right at 9 a.m. when the doors open. 3. Check her in under the name R.L. Stine: If you’re comfortable telling a little white lie, then making the receptionist believe that your mom is world-renowned children’s horror author R.L. Stine is a surefire way to get the VIP treatment. 4. Cover the birthday cake in hair ahead of time so she doesn’t feel bad if she accidentally gets some hair trimmings on it: Your mom is going to have hair falling all over the place, and you know she’d feel just terrible if some of it got onto the cake. If the cake is already hairy, she can indulge herself without having to worry. 5. Slip your mom’s stylist an extra five bucks to spoil her with an entire bottle of gel: If you really want your mom to feel pampered, the typical one or two pumps of gel won’t do. Have the stylist empty the whole bottle over your mom’s head so that her hair coalesces into a permanent, luxurious helmet of rigid gunk. She will feel so glamorous! 6. Lower all the other customers’ chairs to the floor so that your mom feels like royalty: When your chair is higher than everyone else’s chair, you’re the queen of the world. It is the ultimate symbol of prestige, and everyone in the salon will show the birthday girl great reverence because of it. 7. 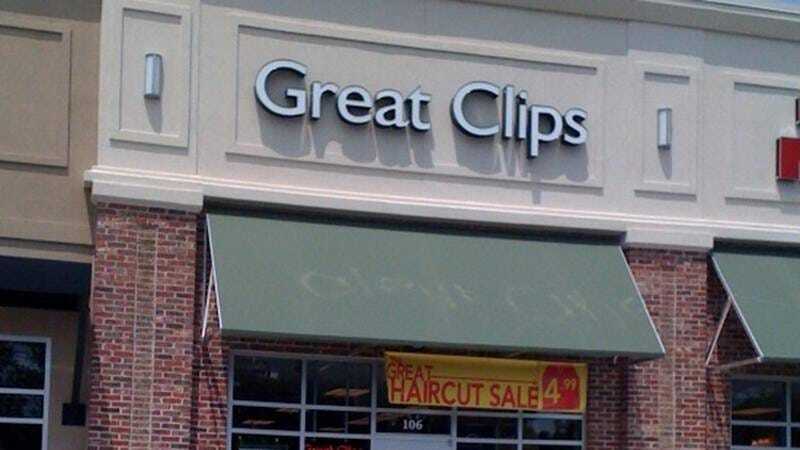 Make her believe she’s at the Great Clips flagship location: A birthday party at the Great Clips location that started it all would be one of the greatest honors of your mom’s long, long life. Get everyone at the party to play along and convince her she’s at the flagship store—it’s something she’ll never forget. 8. Keep her blindfolded the entire time: There’s nothing more exciting than when someone puts a blindfold on you, because you know you’re in for a big surprise. Keep a blindfold on your mom for the entire duration of her party so that she just keeps getting more and more excited as the festivities go on. After all, she’s sacrificed so much for you and has supported you since the day you were born; it’s the least you can do.